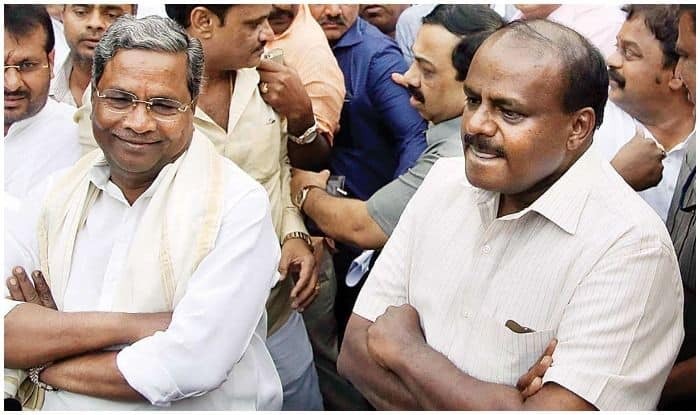 New Delhi: Karnataka seems to be heading towards a crisis amid reports that six Congress lawmakers may resign from the ruling coalition government in the state, a day after two Independent MLAs withdrew their support to the government and shifted loyalty to the BJP. Reacting to the reports, Karnataka Chief Minister H D Kumaraswamy said that he is in touch with the MLAs, adding that the government will run smoothly. “MLAs (Congress MLAs in Mumbai hotel) are unreachable to the media, not to me, I am in touch with everybody and I am speaking to everybody, they will come back. Our coalition is going on smoothly. I was relaxed and I am relaxed. Don’t worry, be happy,” he said. Meanwhile, Congress workers staged protest outside the hotel in Haryana’s Gurugram where the 104 BJP MLAs of Karnataka are currently staying. The BJP lawmakers are expected to hold a crucial meeting today to decide on the future course of action, in what is widely seen as yet another attempt by them to topple the eight-month-old coalition government. In a significant turn to the political war with both the ruling coalition and the BJP charging horse trading flung at each other, two Independent MLAs – H Nagesh and R Shankar (KPJP) — wrote to Governor Vajubhai Vala, conveying their decision to withdraw their support with immediate effect. Both lawmakers sent identical letters to the Governor and requested him to take “necessary action”, a move that reduced the ruling coalition’s strength to 118, but still kept it in the safe zone in the 224-member assembly. BJP state president B S Yeddyurappa, former chief minister Jagadish Shettar and other senior leaders like Shobha Karandlaje are among the 104 MLAs staying in the ITC Grand Bharat resort in Hasanpur Tauru in Nuh district since Monday. Sources said the BJP legislators have been shifted to the resort in an attempt to keep the flock together and thwart any poaching attempt by the Congress-JD(S) combine. Yeddyurappa has rubbished reports about the BJP attempting ‘Operation Lotus’ to topple the government and said there was no truth in it and alleged that the Congress-JD(S) combine was trying to lure Opposition MLAs. ‘Operation Lotus’ is a reference to the BJP’s alleged bid to lure several opposition MLAs to defect to ensure stability of its then government headed by Yeddyurappa in 2008.